Montreal, September 19, 2007 – In light of the cavity epidemic sweeping Montreal and failure by the Ministère de la Santé et des Services sociaux (MSSS) and the City of Montreal to rectify the situation, Montreal’s Coalition for Healthy Teeth filed two official complaints today against these administrations. The first complaint was filed with the Commission des droits de la personne et des droits de la jeunesse against the two above-named administrations, which are dragging their feet in Montreal’s unprecedented cavity crisis. “The City of Montreal refuses to respect the formal recommendation made in June 2006 by Montreal’s Public Health Director that it add fluoride to the drinking water to fight the cavity crisis, and the MSSS refuses to force the City to respect this recommendation. Meanwhile, tooth decay is continuing its unrelenting rampage. As though this were not bad enough, the number of facilities to treat severe cavities is on the wane, and children are again being made to bear the brunt of politicians’ negligence,” lamented Dr. Stephane Schwartz, Director of the Monteal Children’s Hospital dental clinic and President of the Coalition. “Dr. 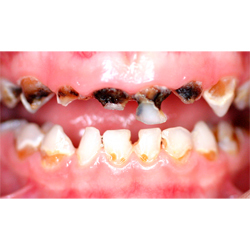 Philippe Couillard, Minister of Health and Social Services, has all the relevant information on the cavity crisis devastating Montreal’s children, and has the legal power to force Mayor Gérald Tremblay to take action to improve their situation. In doing nothing to resolve this dire public health problem, the Minister is sorely misjudging the urgency of the situation, despite a report by the Institut national de santé publique du Québec (INSPQ) recommending fluoridation of the drinking water. This is unacceptable and unfathomable,” added the Coalition’s President. This INSPQ report, published in June, paints a grim portrait of the health of Quebec’s children and states that current preventive measures are not enough to meet the needs of all at-risk segments of Quebec’s population. This same report by Quebec experts acknowledges that adding fluoride to the drinking water is the most effective means of reducing dental cavities, mainly in underprivileged individuals, and recommends that the MSSS maintain the objective it set in 2005: to ensure that 50% of Quebecers have access to fluoridated water by 2012. The Coalition’s second complaint was filed with the City of Montreal’s Ombudsman against the Tremblay administration, which still refuses to apply this formal recommendation by Montreal’s Public Health Director, who declared Montrealers’ dental health to be perilous. “These complaints are our last resort to make sure that young Montrealers’ rights to better dental health are respected,” concludes Dr. Schwartz. Note that up to 47% of Montreal’s kindergarteners (depending on the borough) have an average of 14 or more cavities. Montreal's Coalition for Healthy Teeth is an initiative of the Montreal Children's Hospital, with 1,000 individual members. Its objective to fluoridate Montreal's drinking water is endorsed by numerous major organizations, including the Association des pédiatres du Québec, the Ordre des dentistes du Québec, the Ordre des hygiénistes dentaires du Québec, the Collège des médecins du Québec, the Ordre des pharmaciens du Québec, the World Health Organization, the Fédération des médecins omnipraticiens du Québec, and the Coalition of Physicians for Social Justice, to name a few. Notice to media: Dr. Stephane Schwartz will be available for interviews.